truthjihad.com blog: CIA whistleblower & White House whistleblower agree: George H.W. Bush is evil! CIA whistleblower & White House whistleblower agree: George H.W. Bush is evil! Both agree that George H.W. 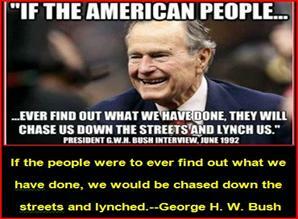 Bush is as evil as a human being can be. Chip Tatum resigned from his Special Ops position when Bush ordered him to "neutralize" Ross Perot. Barbara Honegger resigned from the Reagan White House when she learned that Bush had cut a deal with the Iranians to keep the hostages locked up in order to ensure Carter's defeat. From 1980 through 1983, Barbara Honegger served as White House Policy Analyst and as Special Assistant to the Chief Domestic Policy Adviser to President Reagan. From her perch in the White House, Barbara noticed some very strange activities after the March 30th, 1981 shooting of President Ronald Reagan - ostensibly by a lone nut named John Hinckley, Jr., whose parents were close family friends of Bush. Based on her serendipitous presence at a meeting of Reagan's top advisors shortly after the assassination attempt, Barbara learned that those advisors knew that Vice President George H.W. Bush was behind the shooting; she witnessed them drawing up a secret and marginally-Constitutional plan to deceive the world in the event that Reagan suffered long-term incapacitation, in order to deny the presidency to Reagan's would-be assassin, George H. W. Bush.